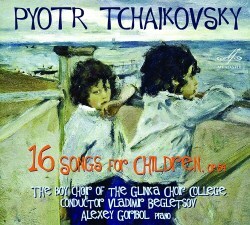 The 16 songs for older children, as Tchaikovsky explicitly wrote, were written for high voice with piano accompaniment, but he also added that “some of the pieces, e.g. No. 5 or No. 8, may be performed by a children's chorus in unison". This issue is consequently no outright violation of the composer’s aim. The boys of the Glinka Choir College also sing innocently with bright, beautiful voices. They are by and large sad songs and not quite for children but about children. A tenor (as on the Melodiya set with the complete Tchaikovsky songs) or a soprano may be able to interpret the songs more deeply, but it is a pleasure to just lean back and savour the wonderful melodies with these fresh voices. The background of the cycle was a request from Children’s Holiday magazine and Tchaikovsky contributed with the song My Lizochek, a setting of a poem by Konstantin Aksakov, which later became the last song of the cycle. Shortly after the publication of the song the composer received as a gift a volume with poems by Alexey Pleshcheyev, with a dedication from the poet to Tchaikovsky. They had known each other for several years and Tchaikovsky had set other poems by Pleshcheyev. Tchaikovsky immediately set to work and picked twenty poems for the intended cycle. In the end only fourteen were finally completed. Besides My Lizochek, a poem by Ivan Surikov, The Swallow, was added to the cycle. According to the liner-notes for the present issue several of these songs have been very popular and frequently performed, but the entire cycle in the original order only rarely. I enjoyed the whole work very much when listening to the Melodiya set, mentioned above, and returning to them in this new guise only confirmed the impression. The recording is excellent and Alexey Goribol is a pliable accompanist. My only regret is that the texts are not enclosed. Let me just add that The Glinka Choir College is one of the oldest professional educational institutions of Russia, having its origin in 1479. Throughout its existence the Glinka Choir College has played an important role in musical education and the establishment of Russian musical culture. Tchaikovsky lovers shouldn’t miss this opportunity to add what I gather is a unique recording of some really beautiful songs.